We have a proven track record of providing Electrical Design, Engineering and Drawings services with quality for Electrical Power Generation, Transmission & Distribution Substations (upto 400kV), Industrial Substations, Electrical Balance of Plant (EBOP) of Thermal Power Plants, complete electrical, controls & automation systems for Iron/Coal Handling Plants, Process Plants and Misc. Industrial Units at a compitative rate. 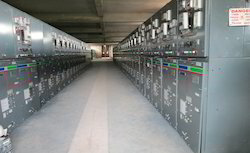 We have undertaken Electrical Design & Engineering services of more than 100 substation projects and innumerable power distribution system projects over a decade for reputed Clients like Areva, Alstom, Siemens, Sterling & Wilson, NIT-Rourkela, KEC International, Power Holding Co. of Nigeria etc. Following services are provided under this category. Electrical layout plan and elevation shows location of different electrical equipment in switch yards and control buildings and also in plant electrical rooms. The drawing also shows clearances among various equipment, clearances with walls or building structures, clearances from mechanical equipment in the shop floor and maintenance areas for removal and overhauling of electrical equipment. Building dimensions (LxWxH) are decided on the basis of these drawings. Finalization of these drawings also allow designing of cable trenches, earthing systems, lighting and lightning protection layouts of the substation and electrical buildings. We can offer following type of electrical layout work. EHV air insulated switchyard layout plan and elevation. EHV gas insulated substation layout plan and elevation. Electrical layout plan and elevation of Switchyard control building. 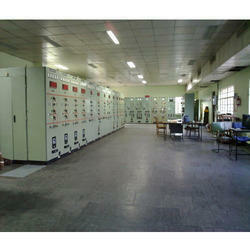 Electrical layout plan and elevation of Indoor substation buildings. 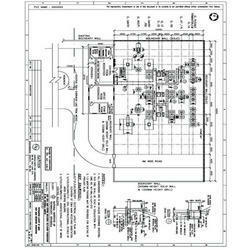 Layout plan and elevation of LT switchgear rooms. 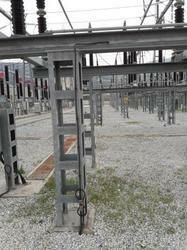 In air insulated outdoor switchyard, an equipment is connected to conductors through connectors and conductor to conductor overhead connection are through clamps and tee connectors. Erection Key Diagram (EKD) is a drawing in which requirement of various kinds of connectors and clamps are identified and BOQ is formed for procurement. The BOQ also includes quantity of conductor, shield wire and Aluminium tube bus. Plant control room, pull pits. Control schematics for unidirectional motor feeders. Control schematics for bidirectional motor feeders. Control schematics for conveyor motor feeders. Control schematics for HT motor feeders. Control schematics for star-delta starters. 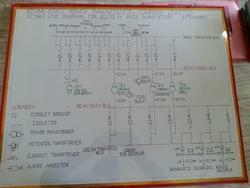 Control & Protection schematics for HV/LV circuit breakers. Protection schematic for Outdoor switch-yards. 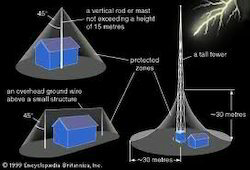 Protection schematic for Indoor substations. 415V PCC panels upto 6300A. 415V MCC panels upto 4000A. 415V DB panels upto 2000A. 5. Battery charger sizing calculation. 8. Power cable sizing calculation. 9. ACSR conductor and AL Tube sizing calculation. 10. Short circuit force calculation in strung bus and rigid bus. 11. Sag tension calculation in strung ACSR conductor. 13. LV AC and DC breaker sizing calculation. 15. Short circuit and earth fault current calculation. 17. DG set sizing calculation. 1. EHV switchyard equipment like SF6 CB, CT, PT, CVT, LA, Isolator, Insulators, clamps, connectors, conductors and hardwares. 2. 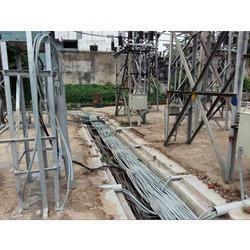 Power and distribution transformers. 5. 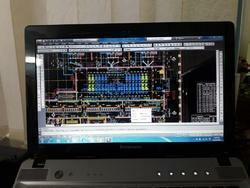 SCADA system panels, HMI and FO Communication system. 6. 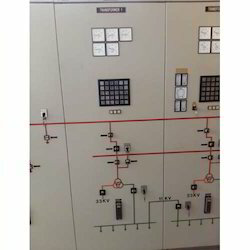 LV AC and DC DBs and switchgears. 8. Power and control cables. 11. 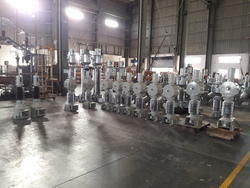 EHV Transmission line and equipment. 13. Cable tray, earthing and lightning protection system materials. 16. Motors and motor control centers. Depending on the Isokeraunic level of one place, outdoor equipment in a plant are exposed to direct lightning strike. Hence there is a need to protect all outdoor equipment from such direct lightning strikes by providing lightning protective systems. These lightning protective systems can be of various types as per NFPA/IEC standards. Our engineers have long experience of successfully designing such systems in India and many other coutries to protect equipment from severe damage by lightning strikes.